The Arizona Operating Engineers Apprenticeship is a statewide training program for Heavy Equipment Operators, Plant Equipment Operators, and Heavy Duty Mechanics. 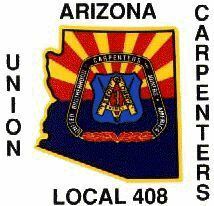 The Apprenticeship Program is jointly administered by Local #428 of the International Union of Operating Engineers and the Associated General Contractors of Arizona. Your Apprenticeship will consist of 80 hours Pre-Training, 432 hours of Related Training Instruction, and a minimum of 3 years/6,000 hours On-The-Job-Training. Being a statewide program, you may be required to work anywhere in the state, which means, you MUST have suitable transportation. Your Pre-Training and Related Instruction Classes will be held at our 191-acre Training Site located four (4) miles northeast of Casa Grande, Arizona. The role of the Arizona Operating Engineers Apprenticeship Program is to supply well-trained Operating Engineers to the Construction Industry. We are dedicated to this role and are only interested in applicants who take PRIDE in their work, BELIEVE in eight (8) hours work for eight (8) hours pay, and are willing to WORK HARD TO ACHIEVE A HIGH STANDARD OF SKILL in their chosen field. Applications accepted Mondays and Friday 7:30 AM - 4:00 PM. 3985 N. Benan Venture Dr. Applications accepted on Monday and Friday from 7:30 AM- 4:00 PM. Applicants for apprenticeship positions must be a minimum of eighteen (18) years of age. Applicants may be required to submit documentation, which verifies this requirement. Applicants must fill out an application form provided by the union hall. The union hall shall hold all applications in confidence. No names, addresses or phone numbers will be made public without the applicant's prior, written, approval. All applicants must be United States citizens or have proper Immigration and Naturalization Service papers for working in the United States. Applicants must complete an interview at the time of application. Applicants must have a sufficient educational understanding to take related instruction training classes, understand safety regulations, and follow written and oral instructions. A high school diploma or GED is not required for admission into the program, but it is preferred that an applicant has completed high school or obtained a GED. Within the guidelines of the American Disabilities Act, all applicants must be physically capable of performing the work of the craft. Applicants must have an oral interview with a business agent of the program to which they are applying.